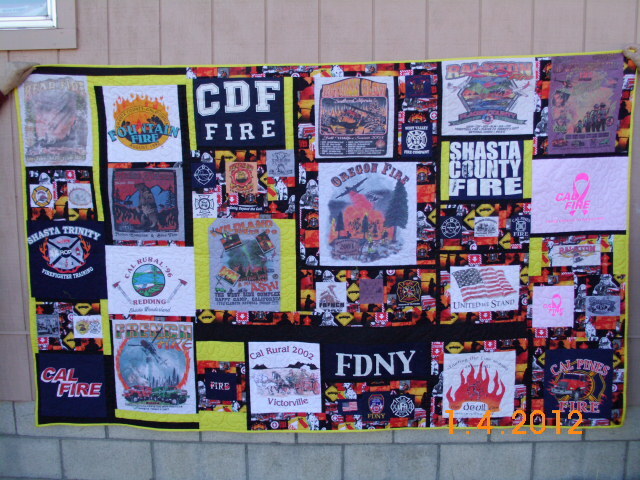 tshirt quilts with all different size pieces. 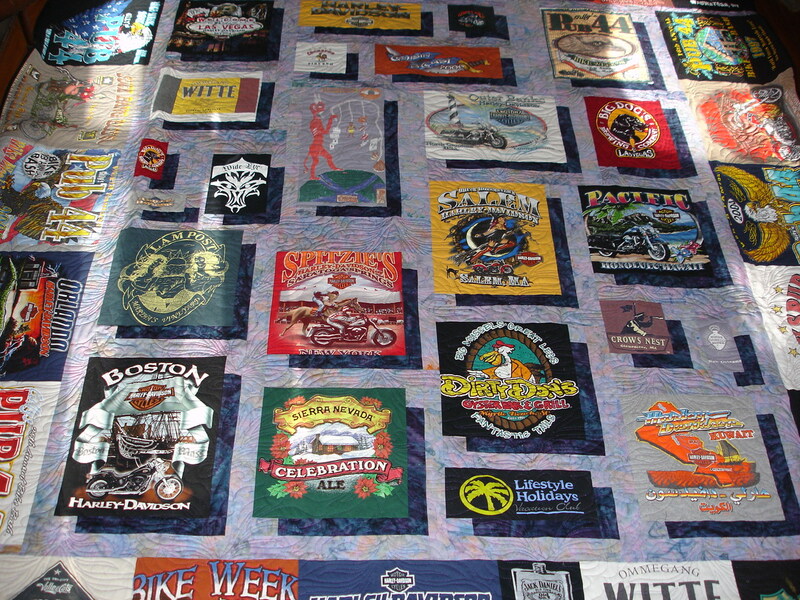 Thread: tshirt quilts with all different size pieces. I found this pattern (sort of) of how to put together a tee shirt quilt that has all different size pieces. I love this idea, but looking at the pattern, I can't figure out how you piece it together and how do you make blocks or strips or however to connect it all together? I haven't done a quilt like this before, only very symmetrical blocks. So I am really confused on how to proceed. I like that the math is already done and I just have to match up cuts to what's there, but is there a tutorial out there to explain the final assembly? Thanks in advance! if you look at the very bottom of this screen, you will see the pattern I am looking at. Sorry I couldn't find a more direct link. Fabric choice can make all the difference. Be fearless. I think you have to work with set-in seams. There are lots of tutorials online that show you how, and it's not that hard once you get some experience. Also look at partial seams, slightly different. 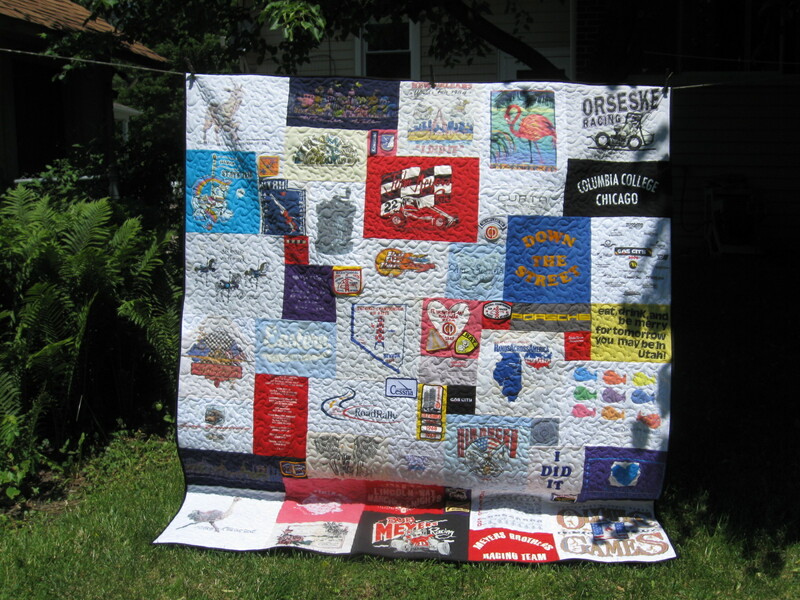 I have done a t shirt quilt that had blocks of different sizes. What I did was to put different size/widths of sashings to bring them up to a certain size. I would say it is a combination of set in seams and partial seam method. You can google partial seams to find tutes on it. It would have a ton of them. There may be an easier method but you would most likely have to purchase TocoolTshirtsquilts book to get it. I certainly don't see an easy way to do it with that layout. I don't know if the above link is the same person as the book "How to Make a Too Cool T-Shirt Quilt" by Andrea T Funk. My daughter made this quilt for me using the book. There were no set-in or Y seams. She did not use a stabilizer or anything under the shirts. The most time-consuming part was charting it all out--she said once it was charted on graph paper, it went together quickly. She also sewed on patches from various activities I'd been involved in. She quilted an all-over meander on it. This is my favoritest quilt ever. It depicts my life over the last 40 years. That's what I did, too. I placed the t-shirts where I thought they would look balanced then I filled in spaces with sashing and with small blocks (pinwheels, flying geese, four patch, etc.). One step at a time, always forward. Thank you, I love the sashing idea. I especially love the drop shadow on feline fanatic's. Thanks, I have not done partial seams or set in seams, so I have some learning to do. Thank you for the insights. I agree. I have seen a lot of t-shirt quilts but NOTHING as STUNNING as yours Felinefanatic. It was absolutely stunning ! !